It’s been almost FIVE years since I created MIS! 5 YEARS! This little blog of mine is a full blown kid. Unfortunately, aside from writing regular blog posts and trying my best to stay active in the social media scene, I haven’t done much to facilitate it’s growth. Sure, there’s been a few amazing partnerships and some cool opportunities, but I’ve honestly just let this space be what it is and that’s been good enough. So you can imagine my reaction when Vishnu asked what I want out of this site. Ummm…whaaaa?? I told him that it’s just a hobby blog for now and that I’m having fun! But that wasn’t a good enough answer. He asked me what I meant by “for now,” and why I have ads, use affiliate marketing, etc. if it’s just for fun. He also asked what my longer term plans are and what I’m doing to help them become a reality one day. I pushed back at first, but then when I was alone, I thought about his questions. What do I want for MIS? I honestly don’t have a concrete answer to that question. I know that for now (there I go again!) it will be something I pursue in my spare time. But at the same time, I also know that it’s something I want to put more time and effort into. I jotted down notes and ideas while flying to Chicago this past weekend. My main goals for MIS center around growth and writing for external sites (still mapping this out). I also thought through my personal rules/principles. First and foremost, MIS will always be an authentic, real, genuine space. More than anything else, this means the most to me. Based on what I’ve read recently, I know it’s possible to grow blogs using targeted strategies and tools. But I don’t want to go down that path. I want MIS’ growth and development to be more organic. As far as content is concerned, I have no plans to change my focus. If anything, I’ll be adding some more stuff to the mix! I seriously should’ve named this blog My Inner Organized Chaos! Again, none of the above is concrete. I could very well find that as much as I want to spend time here, my attention is needed elsewhere. Good thing I’m a long term thinker! However, the one concrete thing happening in the next month or so is that MIS is getting a facelift! Over the last five years, everything but my current header, has been all me. I’ve done 99% of the design/backend work myself. And while it’s been a great learning experience, I’ve made some major mistakes! I lost all of my subscribers…twice. I also deleted the Jetpack plugin recently because I was having issues and couldn’t get it to reinstall. This means all of the WordPress.com features I love/am used to no longer work. Ahhh…such a mess! Needless to say, I’m outsourcing this redesign. Aside from providing input and approving stuff, I’ll have nothing to do with it…a very good thing! My #1 goal is to give MIS a modern/fresh/easier to navigate look and feel. MIS will also be mobile friendly going forward, which is super important because more and more of my readers use mobile devices. So please bear with me as we clean things up around here. I kept this look for a while. The header was actually a word cloud that Vishnu created for me. It didn’t show up for some reason, but I remember loving it! This was the design I went with next because I wanted a white background and something a little more grown up. If you’re wondering why I’m sharing all of this it’s because 1. I personally love it when bloggers share their thought process around blogging and 2. I believe that as readers of this blog you deserve to know what’s happening and coming next and 3. It’s exciting and fun! My Inner Shakti’s growing up, and I hope you stick around to see what’s next! Bloggers, how long have you been blogging? Readers, how long have you been reading blogs? 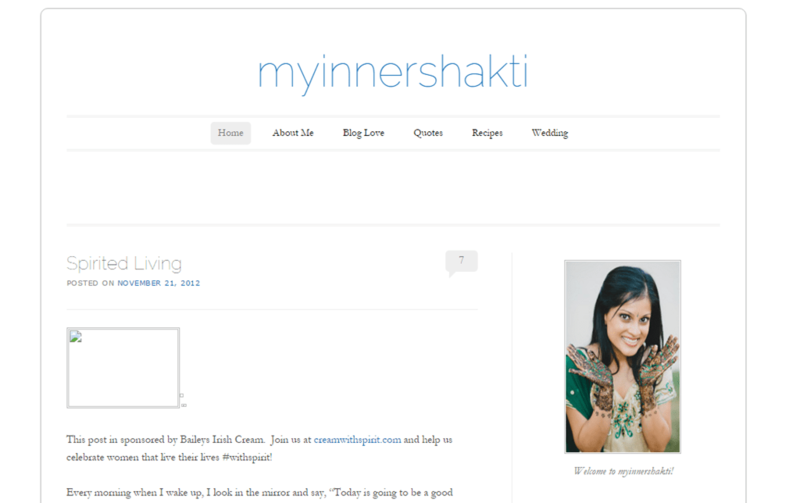 My Inner Shakti Turns 5! Thanks, Tanvi! I think half my battle was deciding that growth was something I wanted enough to put work into! And you better not go anywhere! Where else would I go for delicious food reviews that make my mouth water! A-bloody-men. This is so important and unfortunately, such a rarity in today’s day and age. Organic growth > paid or outsourced growth. It’s so easy to buy followers or do other antics but in the long run, it’s detrimental. I’m excited to see where MIS goes- I’ve said it before but you have a talent for writing- I can read your posts with no pictorial side kicks added. You’re making me blush, A!! But seriously, thank you. Means a lot coming from you.